General Motors has always been a company of many brands, and for almost 50 years, consisted of five core brands: Chevrolet, Pontiac, Buick, Oldsmobile and Cadillac. Under the tutelage of president Alfred P. Sloan, each brand was tailored to a specific demographic and operated within GM as if a separate company. As a result of this autonomy, and competition between brands, some very interesting cars came out of the five brands over the years. The poster child for innovation, though, was probably the Oldsmobile Toronado. Our contact at East Hills Chevrolet of Roslyn, a local Chevrolet dealer in Roslyn, NY, says it is the most ground-breaking automobile ever made by an American manufacturer, before or since. In order to more fully understand the release of the remarkable Toronado, consider the times in which it was born. In the late 1950s, the huge battlewagon cars of the early fifties were being challenged by smaller, more frugal imported cars. Cars such as the English Mini, French Citroën 2CV and the Swedish Saab 93 were selling briskly and they all had one thing in common: front wheel drive. Knowing that this technology was rapidly being accepted by American public, the timing was right-on for a full-size, truly American car with front wheel drive. Sloan decided that a front wheel drive car should come out of the Oldsmobile division, and with marching orders to proceed, development on the Toronado began in January of 1958 under the direction of GM assistant chief engineer John Beltz. The first order of business was to design a front-wheel drive system robust enough to power a full-size car. The engine was no problem; GM made plenty of powerful engines. The transmission was also no problem because the Hydra-Matic Division made plenty of robust transmissions. The problem was coupling them together. Oldsmobile’s solution was the first engine-transmission coupling chain drive. Called the Hy-Vo, this heavy-duty chain drive allowed engineers to use a Turbo Hydra-Matic 400 as the basis for an all-new transmission for the Toronado. Called the Turbo Hydra-Matic 425, the transmission is essentially a TH400, with its gearbox and tail-shaft separated from the torque converter and turned 180 degrees. An issue that Oldsmobile had to deal with was torque-steer. Torque steer is a phenomenon that mostly affects front-wheel-drive cars where heavy acceleration causes the vehicle to veer to the left or right. The danger of this is that the direction the vehicle goes can be unpredictable. Front-wheel-drive cars have always suffered from torque-steer. The problems can be bad enough in a 2,600-pound Chevy Cavalier, but imagine the torque-steer of a 425-cu.in. with 4,000-lbs.ft. of torque to each front axle. To solve the torque-steer problem, Saginaw engineers used a rubber sleeve, which allowed 7.5 degrees of twist under the extreme torque conditions that the Toronado was capable of. Thanks to that coupling, any roughness exerted on either axle was absorbed. The finished product handled well thanks to the suspension. Unlike front-drive European and Japanese cars that would come on the market in the 1970s and 1980s using MacPherson strut-type suspension systems, the Toronado used stiff, performance-oriented coil springs and torsion bars to suspend the car. 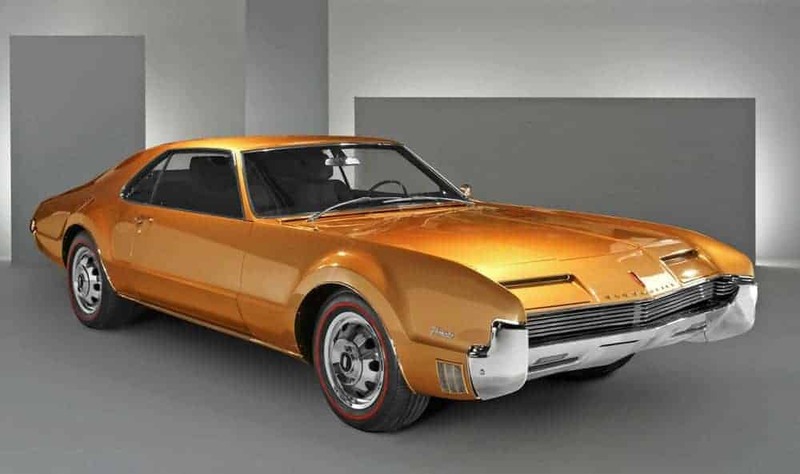 Contrary to popular opinion, the 1966 Toronado is not a unibody-car. The body has a 3/4-length box-section frame underneath that ends at the rear spring perches. Part of the confusion comes from the fact that the Tornado has what its designers called “the unibody look,” meaning that the rear body section features a continuous sweep of sheetmetal with no breaks. Often overshadowed by the car’s design and engineering triumphs, the Toronado’s unique Super Rocket 425-cu.in. V8 developed 385 horsepower and 475-lbs.ft. of torque and featured a dual-snorkel air cleaner that feeds a reworked Rochester 4-bbl. Quadrajet carburetor that put out a hefty 800 cfms. Exhaust gases exit through cast-iron manifolds and flow into a single dual-chambered muffler, before being split into dual resonators. Contemporary road tests showed that the big Tornado could accelerate from zero to 60 mph in around 8.2 seconds, making it faster that most smaller cars with greater performance reputations. Add to that the fact that you sit comfortably behind the aircraft-inspired steering wheel, along with five of your generously proportioned friends, and the Toronado’s true place in performance history is almost unmatched.